Up To $100k of Incentives Available! With our thirty years of experience in the medium duty commercial truck business we will build the right truck for your business needs. Our sales staff is trained and up to date on all the latest manufacturer information and always passes that knowledge to our customers. As the premiere dealer of new and used medium-duty trucks in Fresno, we provide trucking solutions for small to medium-sized businesses in a variety of industries, from beverage distributors to agricultural operations. Rely on our knowledgeable staff to provide the parts you need, when you need them. 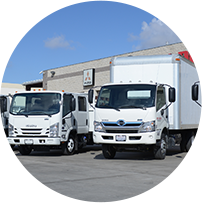 With many parts in stock or just a phone call away, Ry-Den Truck Center is Central California’s source for medium-duty commercial truck parts. Whether it’s routine maintenance, repairs or warranty service, our experienced service technicians will get you back on the road in no time. Need a short-term or long-term rental?